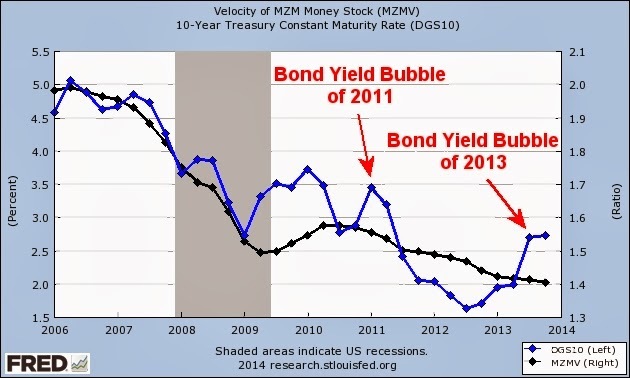 Bond bubbles and bond vigilantes? That's so yesterday. 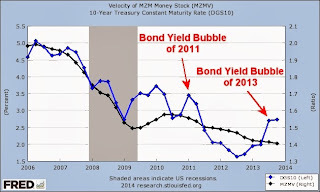 Let's talk bond yield bubbles and bond anti-vigilantes! Let's zoom in for a closer look. I've been a believer in the Great American Bond Bubble since 2011 and all I got was this lousy interest rate. The 10y T does not represented market for years and has recently stopped reflecting Fed intent. Good would be rates going Japan. Bad would be ummm... I'll get back to you. Freaking Greek 10y are below 7%. Don't ask me to make an educated analysis. There's no analysis anymore. I did buy more bonds when the 10 year got close to 3% again. That has worked out so far. I am still betting we will not stray far from the trail Japan blazed. Might be time to rename our mountains. The Fed is the most powerful entity on the planet. I don't know enough to know what its constitutional and institutional limits are. The basic voting make-up prevents it from being 'too' radical I guess, but, again, I don't understand its voting norms, either. But I certainly did not expect that it would be sitting on a $4.1T balance sheet 5 years after the nadir. At $200,000 per, the Fed has directly funded 7.5M mortgages, around 1/5 of all homes sold since 2008. If it can do that, it can do anything. There's an interesting chart at Sober Look on the declining rate of household formation. It appears the "pent up demand" came and went in under two years. I would argue that there are many things the Fed cannot do. 1. The Fed cannot prevent recessions. 2. The Fed cannot force us drive to the malls. 3. The Fed cannot save our malls. 4. The Fed cannot raise real median household income if it is destined to fall. 5. The Fed cannot force me to spend more with ZIRP. The lower interest rates go, the less I spend in order to compensate (lest my nest egg run dry before I die). 6. The Fed cannot permanently prop up the stock market. Pent-up demand will eventually become pent-down demand. 7. The Fed cannot create real prosperity. Other than #5, those are all open for debate of course. I assure you that ZIRP does not inspire *me* to spend more (unless one considers unproductive hoarding, which it has done in the past). It appears the "pent up demand" came and went in under two years. I believe it. I don't think many have even noticed yet, and the recent weather has, shall we say, covered the tracks. Bear alert! I find this quote even more interesting though. To be sure, home construction should improve in the coming years simply because of demographics. That's a theme that's often repeated. I don't think it is "to be sure" at all. My 90 year old mother recently sold the house she'd been living in since 1982. She didn't buy another. All her children (myself included) already owned a house. We certainly didn't need it. I expect a recession "in the coming years" (perhaps this year in particular). Let's see what that does to home construction if I'm right. Might not be right of course. We'll see. The Fed is at the mercy of public opinion, so its power is actually quite limited. If people ever get the notion that ZIRP/QE contributes to wealth inequality, it won't matter that Janet Yellen has a PhD in economics and talks a lot about jobs - those policies will become radioactive. In terms of intervention, the BoJ is far mightier than the Fed. Still, I don't imagine the BoJ continuing Abenomics if/when it loses public support. The bubble 00s were generated by $1T hitting the paycheck economy thanks to home equity shenanigans. The Fed pumping $1T/yr into the economy might be the new normal now. 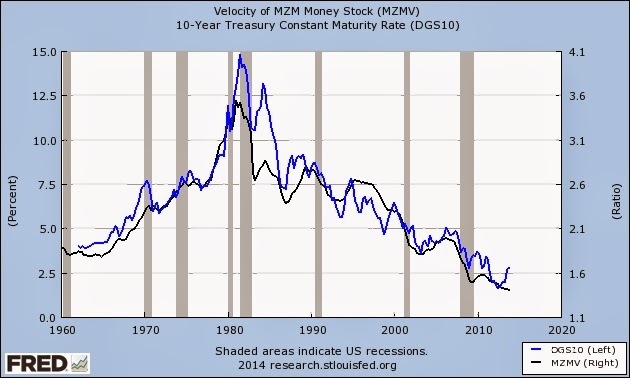 A trillion/yr of sustained free money sprinkling can float a lot of boats. But it's hard to see this actually making things better of course, since I agree real wages are the tricky bit. 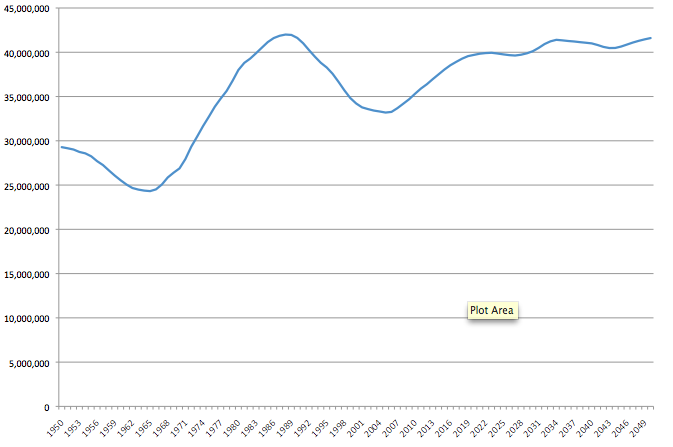 is native-born population age 25-35 from my US birth data (so not entirely accurate). But it shows that we're emerging from a demographic hole as Gen Y is only now really starting to turn 25 (they're age 12-30).